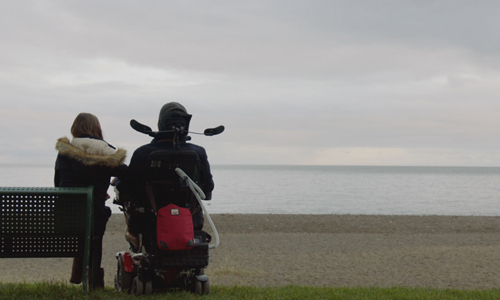 Fenton’s debut feature film comes in the form of a moving documentary on his fellow Irish director, who was diagnosed with Motor Neuron Disease in 2008. 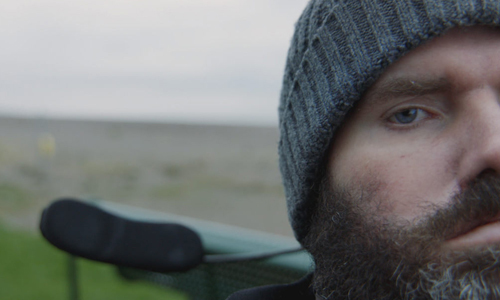 The project is produced by Kathryn Kennedy of Kennedy Films and Lesley McKimm, formerly of Newgrange Pictures, and studies the life of the Fitzmaurice family as Simon writes and directs his debut feature ‘My Name is Emily’ using only his eyes. ‘It’s Not Yet Dark’ is part of the World Cinema Documentary Competition at the Sundance Film Festival, which began yesterday and runs until Sunday, January 29th. Fenton talks through his attraction to the project, the complexities of his process and plans for distribution at home. IFTN: Firstly can you tell us what has drawn you to the documentary format in particular? I originally studied Sociology and Anthropology and then went on to Film and TV studies in DCU. Documentary form was a natural progression of interest for me. I guess I like how it presents the illusion of truth. IFTN: What does it means to go to Sundance, especially given its place in the start of ‘It’s Not Yet Dark’, the book? To be recognised at one of the world’s most prestigious festivals is one of the highest honours for our small team. It’s not like you win a race, it’s subjective so we’re utterly blessed to be picked amongst thousands. Simon and Ruth’s story seems to resonate with anyone who hears it. It's been an incredible experience for me to try and translate their story for the screen. And yes it’s especially appropriate considering the relevance of Sundance to their journey. Simon’s experience of Sundance was live changing for him. His short film ‘The Sound of People’ premiered in Sundance in 2008 and it was around that time he noticed his foot was floppy. 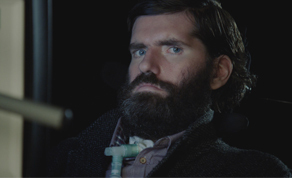 IFTN: How did you become aware of and involved with Simon’s story? Ruth, Simon’s wife, is an old family friend. Our fathers worked together for years and so I was aware of Simon and his condition for a long time before I actually met him. Kathryn and Lesley (our producers) asked me to make a short promo after I helped out with their crowd funding campaign for ‘My Name is Emily’. They asked me to come on board shortly after. Access and trust are obviously so important in documentary, in particular when the subject matter is so personal. I think Ruth, Simon and the Fitzmaurice family were happy to work with me considering my close family tie so from that perspective it made sense for me to direct. IFTN: What was your vision for the project when you first began? Originally I only had about fifteen seconds of footage of Simon before he actually got MND so the story was very much going to be about this endeavour to direct his own film using eye gaze technology, something which has never been done before in history. It’s a remarkable feat for a human. I had crazy ideas about how that was eventually going to look involving Go Pros attached to Simons head and using unusual angles. But thankfully none of that ever happened! I was very lucky to be able to work alongside Kate McCullough (who has previously won best cinematography at Sundance with ‘His & Hers’). Her experience and level headedness grounded some of the more hap hazard ideas! Most importantly we wanted to transform Simon’s story into a cinematic experience. Film is such a big part of his makeup that that was without question the primary focus. So at one point it looked like it was going to be all about ‘My Name is Emily’. It wasn’t until much later that we got hold of any home footage—the first week of the edit in fact. IFTN: Did you always envisage Colin Farrell as your narrator? I knew that voice was going to a huge part of how the story was told. It’s obvious saying it now, but because Simon’s voice was taken from him, the voice he uses now, through his computer, has a certain weight that gives such a magnificent punch to the listener, that it had to be used effectively. I was unsure however if this was the way to go throughout the entire film. It actually wasn’t entirely clear until much later that narration was to way to go forward. The idea of using an actor’s voice was then given a chance through a rough edit. We used an extremely talented young actor, Liam Heslin to voice a temp track originally, and it just seemed to work. So well in fact that we knew we were onto something good. When Colin stepped in to add his voice it became instantly clear why he is regarded as one of the best actors Ireland has ever produced. He got what we were doing instantly. Without hesitation he seemed to nail each line, one after another, often correcting my poorly written script on tenses and last minute changes! He also really cares about Simon, about his integrity, his book, films and his achievements as well of course about our project so he really gave it his all. We feel really lucky to have him on board. IFTN: How much does Simon’s autobiography inform the film, in addition to the making of ‘My Name is Emily’? Well we knew nothing about the autobiography until the actual book launch, about half way through filming! So it actually had no place in the original vision for the film. I was intending on using a mixture of newspaper articles alongside interviews with myself. After the book launch and before shooting began on ‘My Name Is Emily’ however, it became quite clear that the book was the real story we were telling. The main problem was of course that I had no footage from the past to back up anything that takes place in the book. I went on to film most days of the Emily shoot anyway with an intention of giving myself the option of following through with that. Due to the amount of cover we had it would take up a predominant chunk of screen time. Later Simon recognised that we had very little footage of his past so we engaged with social media platforms and asked anyone who knows or knew Simon (friends, family, friends of friends) to provide footage of his past. This was highly unsuccessful. All in all I received about a minute of useable footage. Most of the shots we got were filmed on very old Nokia phones in dark light and the sound quality was absurd. On our first week of the edit Simon mailed us and told us to pick up a hard drive he had prepared. It contained 10 years of home footage and photographs from their lives together. Documentary gold. IFTN: What was your approach to research and development, given the communication challenges presented by ALS? I spent quite a lot of time listening to music, looking at art, trawling through references, writing treatments and discussing ideas with creative producers Lesley and Kathryn. Then I would meet up with Kate our director of photography and see what she thought was possible. She was able to share her own ideas and went on to execute some really beautiful footage. It was a lot of fun. When it came to working with Simon we would email each other to cover any questions either of us had regarding the documentary. When it came to interviews we tried a mixture of pre-emptive emails and then, to switch it up, interviewing on the day, where he had no idea what I’d ask and so he would type back his initial response. So from that point of view we experimented a little. Another time I would ask 20 quick fire “yes or no” questions which was good craic. All in all communication is not an issue with Simon, as long as you’re comfortable with a little delay. It’s actually a nice way to talk and perhaps allows you to think a little before speaking, a habit I think we could all probably refine. IFTN: Can you talk our readers through your shooting schedule and how it related to ‘My Name is Emily’? I would arrive early, study the call sheet and see what seemed like the most interesting parts of the day and just go and see what I could find. It was really lovely. From a film making perspective it was a privilege. ‘My Name Is Emily’ is a road movie so visually speaking there were lots of interesting locations to film in. The entire crew were incredibly hardworking but very helpful to me, the weird Ardee man, pointing a camera at them from odd angles. They all gave me the time of day even in stressful situations and most folks opened up about their feelings working on set. It was an incredibly busy shoot. Simon is Irish for stamina. Well, that's not true... but it should be. What an inspirational work ethic. He gave crew members the energy to work through any typical day to day problems with ease. At times it was quite emotional on set, especially towards the end. I’m still not sure most people understand what an accomplishment it is what he did. It’s an achievement of the highest order. IFTN: Finally what has the post production process been like for you and what future plans are for festivals and distribution? ‘It’s Not Yet Dark’ is my directorial debut. I’m originally from a post production background. I worked as an edit assistant for many years in the UK so really, coming at it from a directors perspective was a dream. Lesley McKimm and Kathryn Kennedy were able to attract some of Ireland’s best to the project. Technically speaking it was a breath of fresh air with minimal issues. Our editor Dermot Diskin is a magnificent story teller and his vision of pace and timing really allowed Simons story to breathe new life on the big screen. 50% of the movie experience is sound. Composer Stephen Rennicks had just come back from the Oscars with Room and agreed to jump on board. I was over the moon. His music lifts the film into a different category. Adding to that, the skills of Mark Henry and Fionn Higgins, who did a magnificent job on our soundscape while our colourist, Dave Hughes, was able to give the film dark and light tones; a real life of its own. Documentary can often be a complicated mix of differing video formats and sources, especially if, like our film, it’s archive heavy, so giving the sequences a feeling of semblance can be quite tricky. Dave with the help of Kate McCullagh seemed to handle it with ease though. As for further distributions and festivals we’re unsure. Ask me after Sundance! Frankie Fenton travels to Sundance with the support of Culture Ireland.